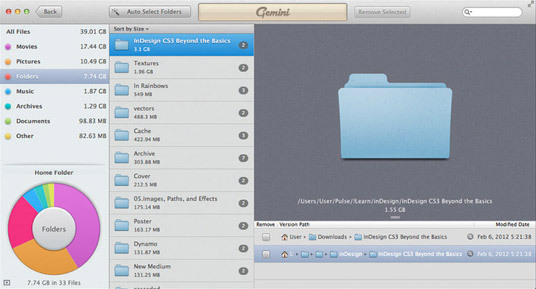 A new Mac application called Gemini is looking to get some of your hard drive space back. By identifying duplicate files and folders on your Mac, Gemini helps you delete unnecessary clutter you didn’t even know you had. It’s surprising how often we make copies of files and folders on our computers only to let them sit and go unnoticed for years at a time. Then when our hard drives start to get dangerously close to full capacity, we frantically go searching for data we can purge in order to free up some space. Gemini is a new application that aims to take care of this problem for us. It’s a duplicate file and folder finder that can scan your Mac’s hard drive, removable media, and network volumes – pretty much anything you can mount in Finder. Developed by MacPaw, the makers of CleanMyMac, Gemini is available exclusively on the Mac App Store ($9.99) for systems running 10.7 Lion. Gemini is not a multi-purpose application – it serves one purpose and stays focused on that task. 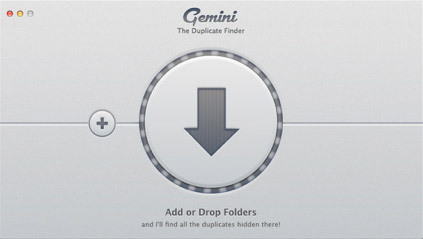 The result is an extremely simple and intuitive interface for finding duplicate files and folders on your Mac. To get started, all you have to do is drag & drop a folder from Finder right into the Gemini window. It will take a few moments to analyze the folder depending on its size, but this is generally a quick process. When the scan is done and you click through to the results, a 3-column window is displayed. The left column shows a breakdown of files types (such as Pictures, Documents, Movies, etc.) along with a graph that illustrates how much space each one is using. You can filter the list of results in the middle column by selecting a file or folder type. Each duplicated file is displayed with an indicator of how many copies were found and their combined file size. When you click one, the right column shows a preview of the file, where each instance is located on your Mac, and the modified date. To remove files or folders, just check the box next to each of them. This adds them to a queue, so nothing really happens until you click the red “Remove Selected” button at the top. Once you click, it confirms exactly what will be removed and warns you so you don’t accidentally delete all copies of a file. When you give the final command to get rid of the listed items, it “shreds” them and moves them to the Trash. You’ll have to empty the Trash to get rid of those files for good. Gemini works really well and helps focus your attention on what’s taking up the most unnecessary space on your Mac. It makes what used to be a laborious task much more efficient. Best of all, I saved over 5GB in my Documents folder alone! A big selling point for Gemini is the “Auto Select All Files” function, which uses an intelligent algorithm to decide which files to remove. While this may sound like a huge time saver, leaving your data to an algorithm’s judgement can be risky. When it comes to deleting your data, only you know what is safe to remove and what isn’t. My personal recommendation is to use Gemini as a helpful duplicate discovery tool, not an automated cleaner. Overall, Gemini is a handy utility with an easy to understand interface. It’s very good at what it does and will certainly benefit any Mac user who is looking to clean up the clutter and regain hard drive space. Gemini is available on the Mac App Store for $9.99. Win a free copy of Gemini for Mac! All entries must be made by February 24, 2012 at 11:59pm eastern U.S. time. At the end, we’ll gather all of your tweets and pick two winners at random! The lucky guys or girls will be announced on this page, so save this article’s URL and be sure to check back later. In the meantime, check out Gemini on the Mac App Store to learn more about how it works. Good luck! Congratulations to our winners, @tashanzac and @marcoutsider! Their tweets were randomly selected and they have each been given a free copy of Gemini for Mac! Thanks to everyone who entered and remember to consider purchasing a copy of Gemini on the Mac App Store. Yesterday I bought Gemini, but I don’t know how to install the software! Please help.